A flourishing creative arts program is important to Christian education, where our priority is preparing students to live lives of worship and service to God. In a time when many schools are reducing or eliminating art and music programs, Lansing Christian continues to offer an excellent creative arts program. 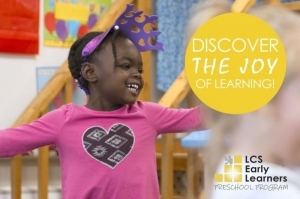 Educating the whole child involves helping students understand, appreciate and develop the many gifts God has given them. In the study of music and the visual arts students learn important skills that enable them to create and perform in a variety of ensembles and art classes. Art competitions and displays, concerts, festivals, and musicals are some of the opportunities we give students to learn and engage the community in becoming a part of the Arts at Lansing Christian. On December 8, Lansing Christian School and South Church jointly sponsored the Keith and Kristyn Getty Irish Christmas Celebration held at South Church. 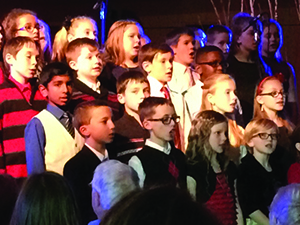 Nearly one hundred Lansing Christian students participated as singers in the choir, servers and greeters. More than eight hundred audience members in the sold-out concert joined in singing the music of Christmas, complete with amazing instrumentation, dance and lots of hand clapping! We are grateful for the opportunity to partner with South Church in bringing this extraordinary event to the Greater Lansing community. It’s a Catch-22. A hopeless cycle. Getting a job requires experience, yet getting experience requires a job. It’s the old chicken or egg scenario. That’s why LCS is offering more and more hands-on learning opportunities like the Video Production Internship, which is currently in its second year. 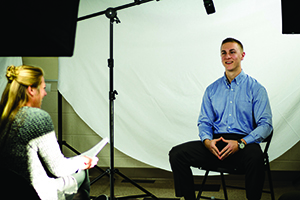 Under the tutelage of award-winning filmmaker Scott Magie, six self-motivated high school students currently receive class credit by working on LCS promotional videos and marketing as interns. 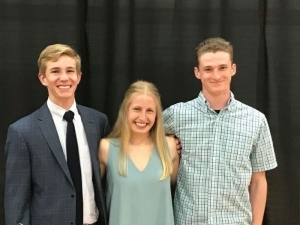 These students enjoy the project-based style of the internship because it is different than their other typical classes and is like a real job, focused on the marketing needs of an actual client (LCS). For example, their weekly responsibilities include photographing a certain topic of daily life here at LCS – such as events, sports, arts, STEM, or people – that can be used to promote the school on Instagram, on Facebook, or in other marketing materials. By taking these photos and writing captions to accompany them, the interns learn hard skills like photography, marketing, and copywriting that will serve them well in a variety of academic and career settings, as well as soft skills like time management, self-discipline, and creativity. Meanwhile, each intern is responsible to complete a major semester video project that requires them to research, write, film, and edit a short biographical vignette about one of our many successful alumni. The completed films will be screened at our annual Black & Gold Celebration on February 13th, which provides the motivation of a solid deadline, an actual audience, and a valuable purpose. In other words, these internships are a way to break the Catch-22 cycle – like creating a chicken without an egg – by gaining experience without a job. Perhaps years from now, these same students will return as successful alumni professionals to be interviewed by future Video Interns. Now that’s the sort of cycle that LCS strives to create! Students learned the basics of making a film the way the professionals do it in an intense two week filmmaking camp. They experienced everything from writing a script, lighting the set and shooting the video to the final stage of editing. To showcase their work, a Black-Tie Screening and Awards Ceremony was held for participants and their friends and family.